On March 28, Alternatives For Girls held the annual Role Model Dinner at Cobo Center. The event raised over $285,000 to support our critical work! The evening was full of fun, inspiration, and hope. After an hour of mingling and a silent auction, the program kicked off with a live auction. Rhonda Walker, Local 4 News Morning Anchor and 2008 AFG Role Model Awardee, emceed the event. The dinner, co-chaired this year by Faye Nelson and Pam Rodgers, provided an opportunity for us to hear from many of the young women whose lives have been changed by AFG’s programs. We heard stories of struggle and triumph, and many reflections on the theme of the night, Rise Up, City Rose. The evening closed with the thrilling “Fund the Mission,” led by auctioneer Chris Aslanian, during which event guests pledged monetary support to AFG. The program was a time of reflection and inspiration as the young women of AFG and the 2018 Role Models shared their stories. Many shared empowering messages, like this statement from Role Model Awardee Monica L. Martinez of Comerica Bank, “My advice to the women and girls of AFG is – life is not always easy, but with hope, the right people behind you and hard work, you can accomplish anything! We would like to thank our dinner co-chairs, Faye Nelson and Pam Rodgers, and the entire Role Model Dinner Committee, who helped make the event such an incredible success! We would also like to thank Rhonda Walker, our emcee, Chris Aslanian, our auctioneer, and all of the dedicated volunteers who helped make the event possible. Thank you to all of the young women from our programs; Rose, Kaye-Lynn, Eboni, Sierra, and Leah, who shared their stories and showed us the courage it takes to rise up and become who they really are. AFG also gratefully thanks this year’s Role Model Dinner Presenting Sponsor, DTE Energy Foundation, as well as the following dinner sponsors: PVS Chemicals, AVL, Ford Motor Company, The Rush Group, The Suburban Collection, Beaumont Hospital, Piston Group, Argent Group, Comerica Bank, Corporate F.A.C.T.S., General Motors, Greektown Casino-Hotel, Health Alliance Plan, Home Depot, Marathon Petroleum Company, Mercedes-Benz Financial Services, Metro West Chapter of Credit Unions, Pam Rodgers, The Skillman Foundation, Special D Events, Trinity Health, Willis Towers Watson, Yazaki North America, George Johnson & Company, Michigan First Credit Union, Ottenwess, Taweel, & Schenk, PLC, University of Michigan Credit Union, WDIV Local 4 News, Hour Detroit, and Union AdWorks. Finally, we want to thank everyone who attended the event for spending the evening with us and for showing such overwhelming support for AFG’s programs. Thank you! Meet Deborah LaBelle, another one of our 2018 Role Models. Deborah is an attorney and writer whose advocacy focuses on the human rights of people in detention, the intersection of race and gender, and the rights of children in the criminal justice and education systems in the United States. In addition to her private practice, Deborah is the Director of the Juvenile Life Without Parole Initiative for the ACLU of Michigan and Coordinator of Michigan’s Juvenile Mitigation Access Committee. She has been lead counsel in over a dozen class actions that have successfully challenged policies affecting the treatment and sentencing of incarcerated men, women and children, utilizing a human rights framework. She has represented clients before the United States Supreme Court and in international forums with an integrated model for reform utilizing concurrent litigation, documentation and advocacy strategies. She is being recognized for her outstanding professional accomplishments and commitment to fighting for human rights at this year’s Role Model Dinner. Deborah LaBelle: I think that mentors were very important to me all along the way. Besides my family, who were mentors for helping me believe in myself, I’ve had many mentors throughout my career. If it was one thing I wouldn’t give up, it would be that. Mentors are crucial. Most of my skill set and vision were forged through mentorships. I try to [provide mentorship] myself. We always have four or five students in the office that we bring in to work on cases, not just law students but undergrads, journalism, social work, etc. I’m proud of how many people have gone on to do incredible social justice work. LaBelle: I’m a first-generation college graduate. So I didn’t know any lawyers. There were none in my family, and I’d never had been in a courtroom. I wanted to do trial law, and that was unusual for a woman. Most lawyers in the room were white men, and since I do trial law, I’m in front of juries and they have their own ideas of what a lawyer should be. So I have to work harder to create that bond and identity, as opposed to white men who walk into a room and people identify with that because of what they see in TV and movies. I’m sort of grateful for my challenges. I came in with a background and a history that many lawyers don’t have. It informed me and it created more opportunities for me in a way because I understood things. I had a deeper understanding of my clients and how the world works. AFG: Which of your accomplishments are you the most proud of? LaBelle: The work that I did with girls and women in detention, both from the work to get rehabilitative programming and to eliminate custodial abuse. It started in Michigan, but it resulted in a federal law that applies all across the country and eliminates custodial abuse for women, girls, and youth. It was a hard-fought case that went all the way to the Supreme Court. This one resulted in a transformation of the way that women are held in custody all across the country. [I am proud of] the impact of that and seeing the number of people, women, and girls, coming out of the experience being incredibly self-empowered. Their courage transformed them and gave them a sense of citizenship that I think was gone because many of them had been poorly treated by the justice system and had lost hope in it. So seeing that they could engage in it and change it was really inspiring. LaBelle: [It is important to empower girls and young women] because they are the hope for transforming the world for the better. The vision of those who are controlling things from the top down hasn’t worked well. The wealth, the strength, the courage, the breadth of experience, and really the kind of depth of character to get beyond the difficulties, to do what it takes. I want their vision. It has to come from them. That’s who I want to rule. The 2018 Role Model Dinner will be held on Wednesday, March 28th at Cobo Center. Click here to learn more or to purchase a ticket. Meet Monica L. Martinez, our third 2018 Role Model. Monica is Senior Vice President of External Affairs for Comerica Bank, which includes the dual roles of managing the corporate contributions function for the Michigan market as well as overseeing all aspects of the bank’s involvement of Hispanic Business Development nationally. Monica oversees charitable contributions budgets in addition to all corporate philanthropic giving in including day-to-day program management of Comerica’s charitable foundation and sponsorship programs in the state of Michigan. Her responsibilities also include developing and maintaining relationships with key community stakeholders. In the capacity of National Hispanic Business Developer, Monica serves as the liaison for the bank within the Hispanic community, directing Comerica’s Hispanic business and community outreach in the bank’s primary markets, which are comprised of Texas, Arizona, California, Florida and Michigan. She is being recognized for her outstanding professional accomplishments and service to the community at this year’s Role Model Dinner. Alternatives For Girls (AFG): Which of your accomplishments are you the most proud of? Monica L. Martinez: The accomplishment that I’m most proud of is my commitment to mentoring young women. I mentor eight girls, basically working with them and meeting them where they are at in their lives. It creates an unlimited amount of proud moments. I’ve seen them graduate college, in their pivotal highest moments, and I’ve seen them in their times of need. If by sharing a story or my life experience shortens their learning curve and helps them reach their goals faster, I’m happy to do that and it makes me feel like I’ve done some good. AFG: Clearly, you have felt inspired to give back to the community. Is there any part of your personal story that has led to this? Martinez: I started out with humble beginnings. I was born in southwest Detroit and didn’t have a whole lot. But I had a loving family who always told me that where we start out in life does not define where we’ll end up. When people believe in you, it changes how you feel and when you feel positive about who you can be and aspire to be, it can change your story. It can be something that changes your destiny. AFG: For many of the women we serve, AFG provides a support system to help them make positive choices. Was there anyone in your life or career who has helped guide you in making important decisions? Martinez: My mother and grandmother in my formative years. Then in certain situations, I’ve had other people who have provided guidance. Some of them helped because I was reaching out and asking for it. And in some cases, there may have been someone who was kind and recognized that I may have needed help and was there for me. Maybe we don’t recognize it, but someone older than us sees something in us and lends a hand and you don’t even know it. Sometimes in our careers, those people act as a guardian angels who tell others about your abilities or potential and because of that an opportunity or a door opens. We don’t succeed without the help of others, we don’t succeed alone. I truly attribute my success to people who have come along my path or journey and have been observant of my enthusiasm to succeed and who have encouraged me along the way. That’s why I turn around and do it for others. Martinez: Where we start out in life does not define where we end up, and when people believe in you it changes how you feel about what you think you can accomplish. It changes your destiny. It is important to know that even If you have humble beginnings, that isn’t going to define you. Having people who care about you, like AFG, is life changing. Martinez: Empowering girls and young women is important so that we don’t put limitations on their dreams or what they can accomplish. It builds strong self-esteem and creates positive future leaders. Meet Alicia Boler Davis, one of our 2018 Role Models. Ms. Boler Davis is the Executive Vice President of Global Manufacturing at General Motors (GM) and has been with the company since 1994. Throughout her time at GM, she has held many other roles and was the first African-American woman to be a plant manager at a GM vehicle manufacturing plant. Ms. Boler Davis has a bachelor’s degree in chemical engineering from Northwestern University, a master’s degree in engineering science from Rensselaer Polytechnic Institute and an MBA from Indiana University. She is being recognized for her outstanding professional accomplishments and demonstrated leadership throughout her career at this year’s Role Model Dinner. Alicia Boler Davis: Yes, I’ve been fortunate. I had my parents who were very instrumental to me as I was growing up. My older sister, who was a straight-A student, everyone loved her, set the bar really high for me because I wanted to be like her. I wanted to get good grades, that was important to me. Bill Boggs was a mentor to me. He was a plant manager and I had a goal to become a plant manager. He taught me a lot and helped me along the way; making career choices, how to handle certain decisions that came up and helped me work through assignments. He pushed me to [become a plant manager]. He was instrumental to me, not only as a mentor but as someone who supported me in my career. Boler Davis: I’d say, even starting from when I decided to study engineering in college, it was a challenging curriculum, there weren’t a lot of females and African Americans in my classes. I had to build my confidence to believe I had what it takes to succeed. I also had to learn to build relationships with people that seemed different on the surface, although we really wanted the same things. I learned to work with diversity. Having the belief and tenacity to not give up, even when things are tough, which is something I’ve had through my childhood, college, and my career. I choose to take jobs that are challenging because I think I’m at my best when I’m at challenged. Working at GM and choosing to work in manufacturing, those are challenges I’ve turned into opportunities. Boler Davis: Our CEO Mary Barra, she has been a role model to me, inside of the company. We had a lady who retired from GM, Barbara Mahone. She was an African American executive in the company and was somebody that I could look up to and learn from. Boler Davis: Being a mother, that’s the thing that I’m most proud of. And being able to, with my husband, raise my two sons to be responsible young men, to follow their passion, to help others, and to just be positive people. I’m very proud of my sons. I’m proud of my career, but I don’t know if I could pick just one thing. I’m very proud to, not only have a bachelor’s degree but to have achieved two masters’ degrees while working, in engineering and business. I’m proud that I’ve been able to do that while working and also use my education to make an impact at GM. And the positive impact I’ve been able to make with the women at GM, providing resources and leadership support so we can continue to support the women at GM. Boler Davis: I would tell them to look beyond their circumstances and to dream big. To believe in themselves and that even when things get tough it doesn’t mean that they can’t [do something] it just means that they have to find a way to overcome. They may have setbacks but the setbacks don’t have to stop them from achieving their goals or becoming the person they want to become. They should continue to pursue that with passion. It’s their life, they shouldn’t let anyone tell them that they can’t believe in themselves or believe in their goals. Boler Davis: Girls are a big part of our world. They have skills and capabilities that can make our world a better place. If we empower girls it can help everyone because they can make a difference in a big way. Breaking down the roadblocks that are in the way of girls achieving their potential is all of our jobs. Here and around the world, we have to make sure that girls are able to contribute. 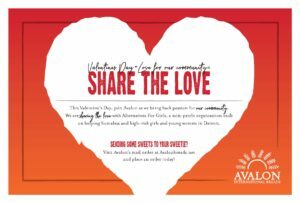 During the month of February, you can support Alternatives For Girls (AFG) when you shop at Avalon International Breads! During the entire month, when you purchase a box of Avalon’s Sea Salt Chocolate Chip Cookies, a portion of proceeds will be donated to AFG. 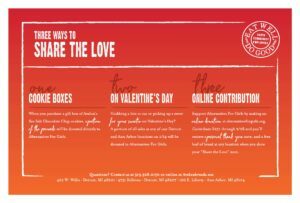 Make an online contribution to AFG of $25 or higher during the month of February, and receive a free loaf of bread at any Avalon location, by showing your donation receipt. 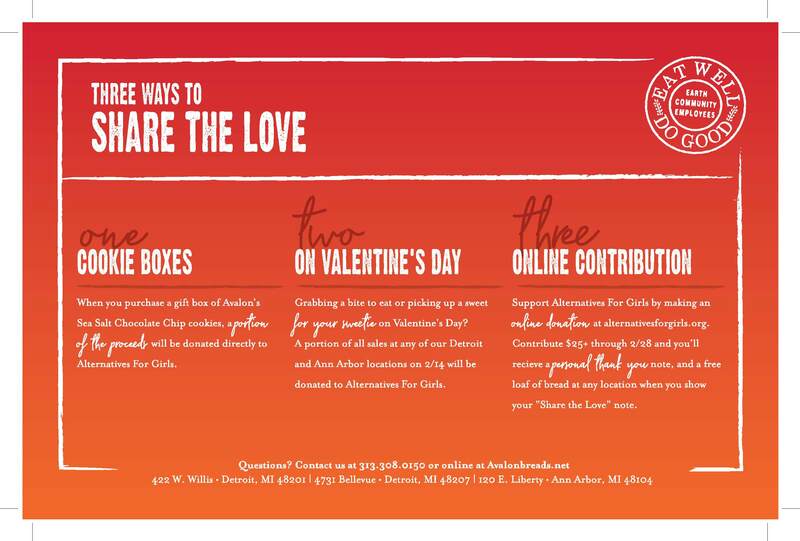 On Valentine’s Day, February 14th, a portion of all sales at each Avalon location will be donated to AFG. 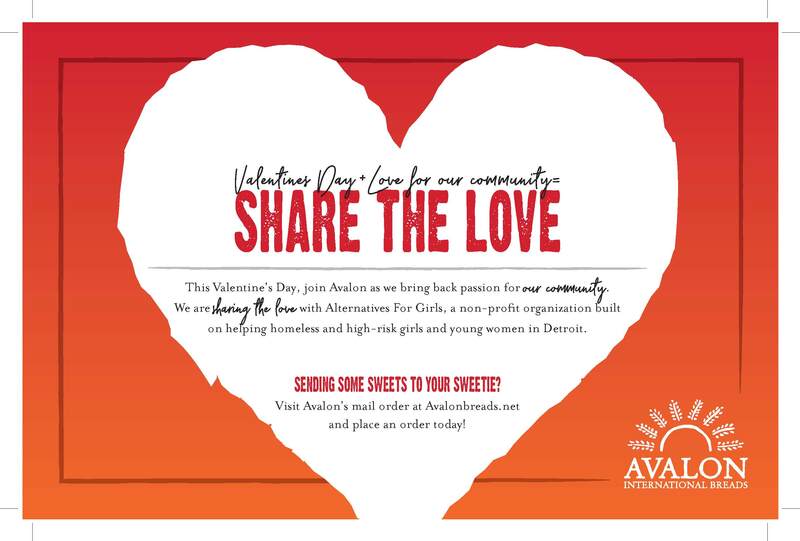 Alternatives For Girls would like to thank Avalon and everyone who makes a purchase to support AFG in the month of February!